These Twice Baked Nutty Meringue Cookie Crisps will be unlike any cookie you have ever baked. 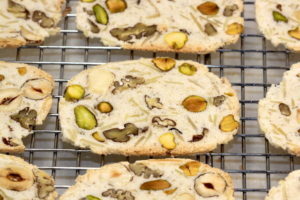 It is a biscotti style cookie, meaning it is baked one more time after it is sliced to create a crispy flavourful cookie. 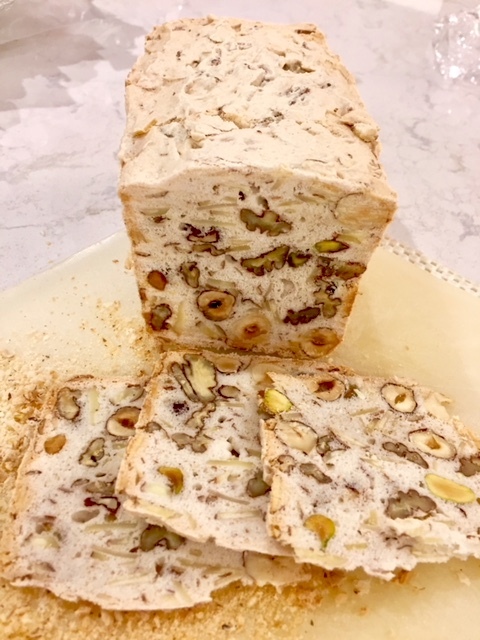 CHEF TALK: This biscotti style cookie (twice-baked) has a meringue base and can be easily adapted to a gluten-free cookie option. They are cracker-like in style and not too sweet. I usually serve them with creamy custards such as crème brûlée or pots de crème. The crisps are also lovely served with Brie cheese or other creamy cheeses and on charcuterie platters (particularly with a smooth paté). YIELD: This recipe will yield a large number of thinly sliced meringue crisps. This is dependant on the type of pan utilized and how thin the meringue loaf is sliced. The 8″ x 4″ loaf pan I used yielded approximately 75 meringue crisps. 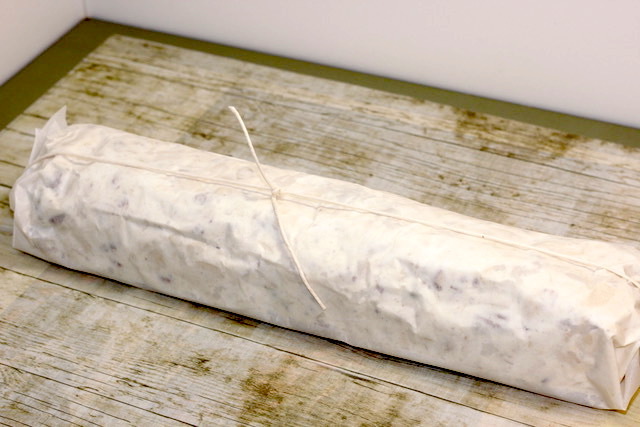 The 3″ x 10″ terrine yielded approximately 100 slices. The freeform variation yielded approximately 100 cookie crisps (using a serrated knife to slice). If you are lucky enough to own or have access to a meat slicer, you will be able to increase your yield. Preheat the oven to 330°F (320°F if using a convection oven). Toast the nuts and set aside to cool. Prepare the loaf pan or pan of choice by greasing with pan spray and lining with parchment paper using the parchment pinwheel method. (See instructions Urb’n’Spice’s Learning Tips – link below). 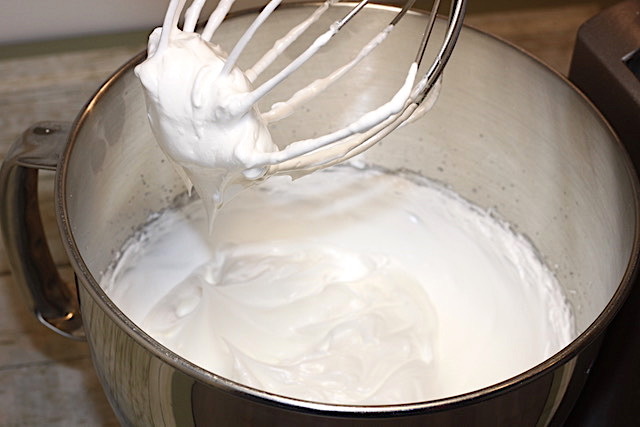 Whisk egg whites until light and fluffy. Slowly add the sugar and continue whisking until you have stiff peaks. Fold in the remaining ingredients with a spatula. (The meringue will deflate somewhat – this is normal). 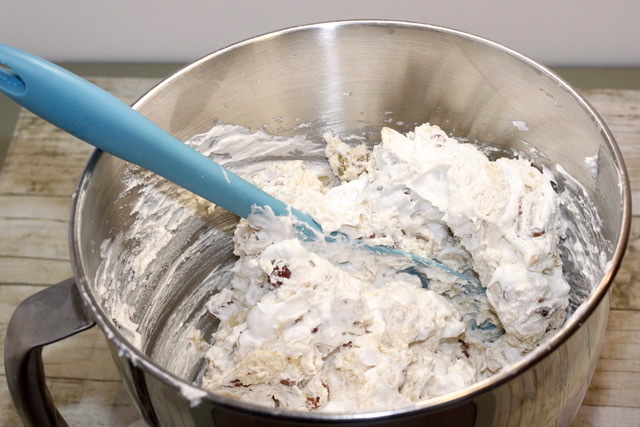 Place the meringue mixture into the prepared pan. Cover the top of the loaf pan loosely with foil (not touching the meringue). Bake for 30 minutes, covered. Uncover, and bake for a further 30 – 40 minutes. CHEF NOTES: Please note that if you are using gluten-free flour, the meringue loaf will not brown as deeply as wheat flour. Allow the loaf to cool slightly, then turn out of the pan. Wrap the loaf well while it is still warm. Once cooled, slice the meringue loaf into 1/8 inch slices with a serrated knife. CHEF TIP: In the professional kitchen, the meringue loaves were frozen and then sliced into 1/16″ slices and left to dry out at room temperature. 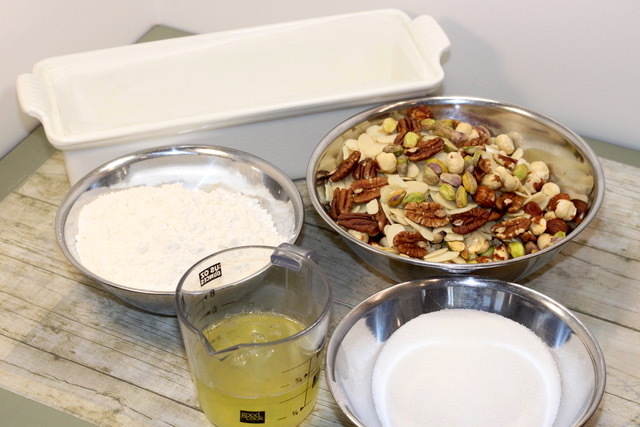 Once the meringue cookies are sliced, place the slices on a baking rack set on a baking sheet (see photo below). Bake the meringue crisps at 330°F/320°F Convection for five minutes on each side, turning them over once. The meringue cookies will crisp up as they cool. Cool the cookies and store them upright in an airtight container. The cookies will keep for several weeks. Place a sheet of parchment paper on a rimmed baking sheet. Using a spatula, scoop the meringue mixture onto the length of a sheet of parchment paper (see photographs below). 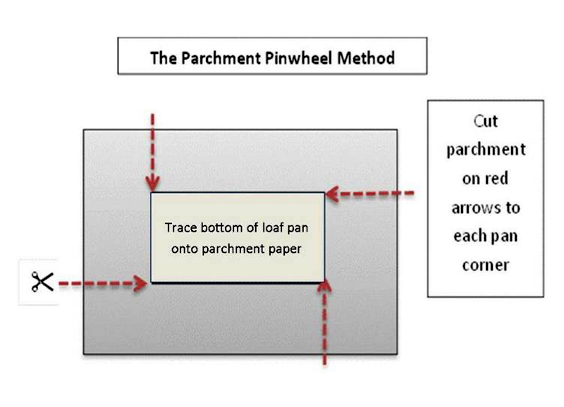 Roll up into a cylinder and fold in the ends of the parchment paper as shown. Tie loosely with a string. Bake for 30 minutes and then untie the string and unwrap the meringue (keeping the meringue on the parchment paper). Bake for a further 30 minutes. Cool and slice as directed above. 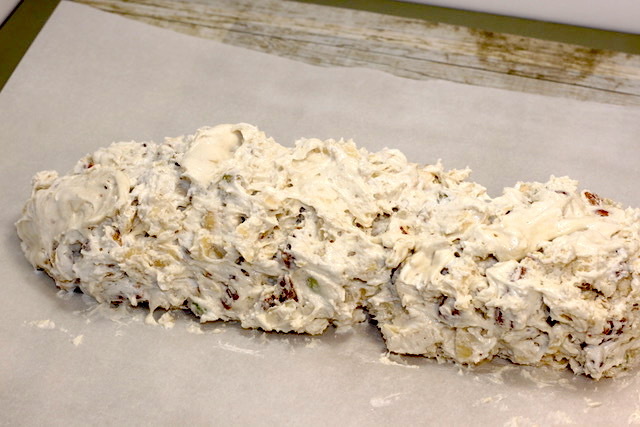 For the freeform version, the meringue-nut mixture is spread onto a parchment paper and rolled into a cylinder. Freeform style of meringue crisps wrapped in parchment and tied loosely with butcher twine. Twice Baked Meringue Cookie Crisps close up. 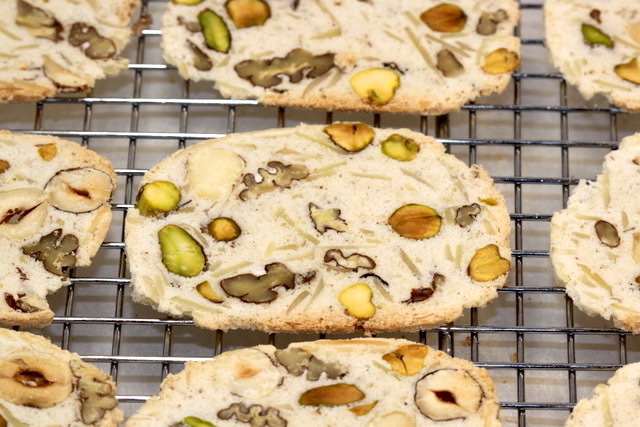 Note the profile of the nuts in the cookies – the sliced almonds make interesting striation-like lines in the cookie. Prepare the loaf pan or pan of choice by greasing with pan spray and lining with parchment paper using the parchment pinwheel method. (See instructions Urb’n’Spice’s Learning Tips – link below). 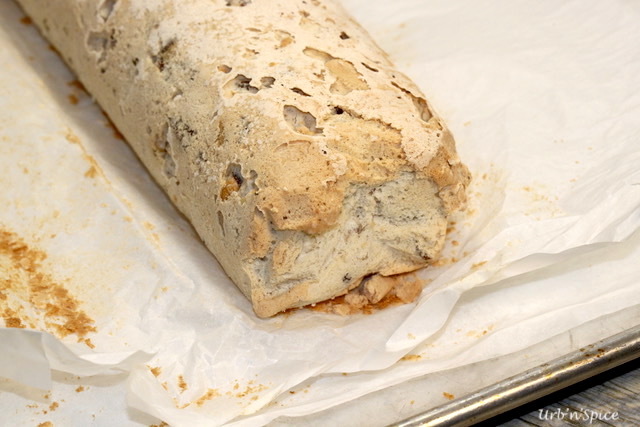 For another baking variation, a free-form meringue loaf, including photographs, please refer to the original post. 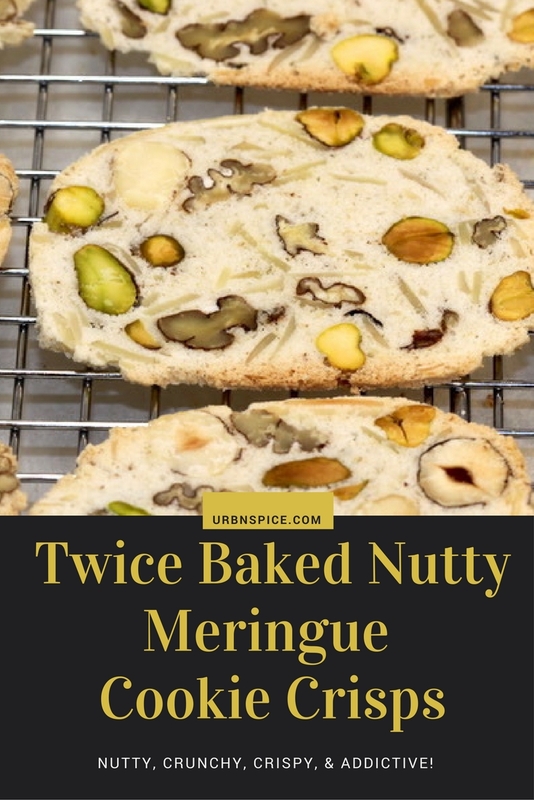 If you try this recipe for Twice Baked Nutty Meringue Cookie Crisps, please leave me a comment below with your feedback. Such a neat recipe, I have never seen one like this before! 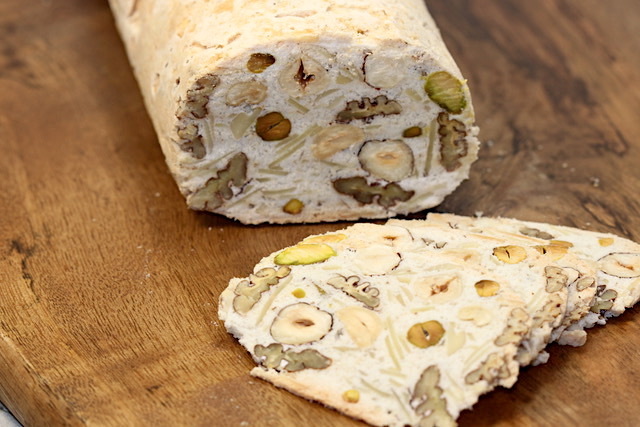 I love how it includes all sorts of nuts in it (especially pistachios!) and I am a sucker for meringue! It is such a tasty treat, Vanessa. I love the profile of the pistachios in these crisps, too. I agree with you about meringues – there is always something fun to do with meringues. Thanks so much for your comments. I know whose house I’m coming to for snacks and tea! This should be enough to feed us both, right? 😉 Looks delish! These look delectable, and so different. I love how many different nuts are in them. These would be so perfect on a charcuterie tray, because they seem like more of a cracker than a cookie. I need to try making these! This is such an interesting recipe. 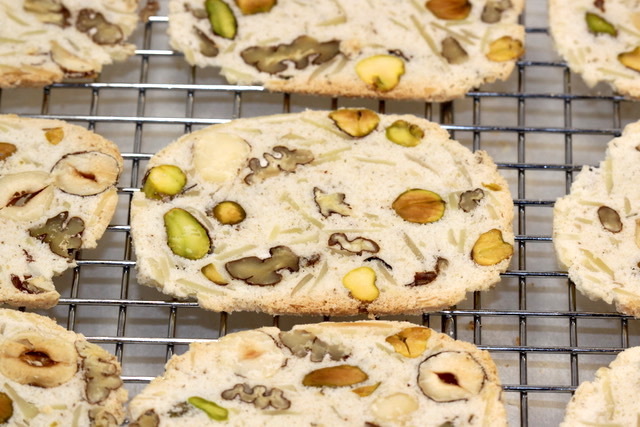 The ingredients are more or less the same as the nougat except for the flour and the technique. These cookies look so pretty and delicious. And I like it how you always have the healthy gluten free option in your recipes which is so helpful. Thanks for sharing, can’t wait to try this. These look fantastic! I can’t wait to try these , these look like they would be great with a chocolate pot de creme as well! Love the in depth instructions as well!! Oh yes, Markus! These little crisps are delicious with custards. I am looking forward to hearing your feedback if you try them. Thanks so much for your comments – it means so much to me! These look and sound wonderful Denise! They definitely make perfect little treats to munch on any time of the day. LOVE them! Thank you so much, Marisa! These Nutty Meringue Cookie Crisps are very delicious little treats, indeed. I hope you get a chance to try them. What a fabulous idea! I can’t wait to try these. Oh wow! These look absolutely divine! Those nuts are killing me! Yum! Those nuts are intriguing, aren’t they, Lily? 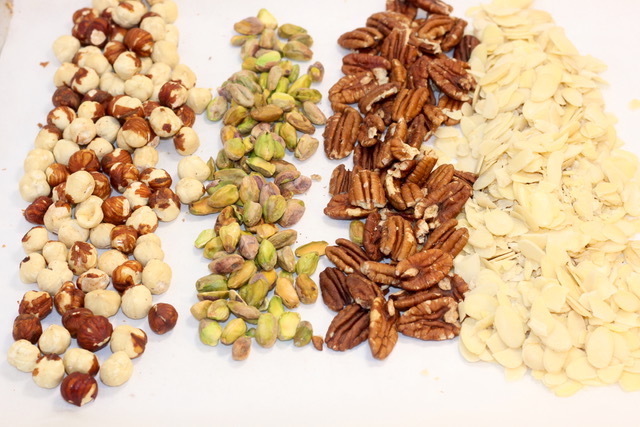 I love the profile of the nuts in the crisps, especially the pecans, pistachios and the almond slices. Thanks so much for your comments, Lily.